The only problem with this self-balancing unicycle is it’s inability to balance itself. You see, it automatically balances along the axis that is parallel to the line of travel. But since there’s only one wheel the rider is responsible for balancing perpendicular to travel. This is really not too much different from a bicycle; balancing while in motion is pretty simple. Only when you slow down or stop are you in trouble. [Stephen Boyer] built the vehicle and uses it for most of his travel around the MIT campus. It carries a pair of 12V batteries that pack enough punch to travel five miles between charges. A 5DOF board senses motion and orientation, with an ATmega328 microcontroller calculating the corrections necessary to keep the rider upright. The demo video after the break never really gives you good look at the thing, but it’s enough to prove that it does indeed work very well. We’re also glad to see that [Stephen] is using a kill-switch while riding. 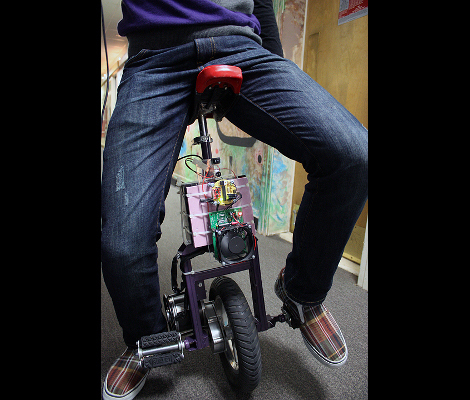 If you’re aching for more electric unicycle video check out this other project too. ← A Robot… That Can See Through Walls! Its like a Segway you sit down on and have to do work to balance with! But it looks cooler than a Segway. I wonder how the torque is on this thing- I have been looking for a long time for something to power an ultralight low-cost electric wheelchair, and $200 each in that form factor could fit that need if it has enough torque to get over obstacles. Any comments? Do want. Just imagine all the looks you’d get on campus riding thing. Thanks for the writeup! I just want to point out that my name is Stephan (not Stephen). It’s all fun and games until someone gets run over by a not so self-balancing unicycle. Tried building one of these around a BMX wheel with a hub motor, trying to copy the “solowheel” which is similar but has no seat. I then stopped when I realised I would probably end up in a hospital casualty department before I ever had the bugs sorted out. Might be worth checking out the steering mechanism in the “Enicycle” for a neat solution to the problem of lateral control.